Description: This Duffield’s Medicinal Fluid Extracts booklet measures 9 x 6 inches and was published in 1868 by Duffield, Parke & Co. It contains the recommended fluid extract dosages for more than 180 roots, leaves, and flowers. Some of these include Bitter Root, Catnip, Golden Rod, Ipecac, Opium, Sassafras, and Wormwood. The Duffield brand claimed to be the purest since all extracts were obtained without the use of any heat. Additionally, this booklet also contained testimonials from doctors used Duffield’s guide in their practices. History: In 1979, Drusilla Martin Cathell (1916-1990) donated her husband Dr. James Luther Cathell’s medicinal fluid extracts booklet to the Museum. 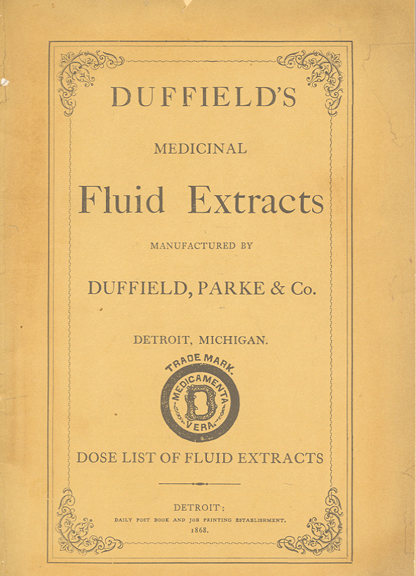 Duffield’s Medicinal Fluid Extracts was published by Duffield, Parke & Co. The company was founded in Detroit, Michigan, by Dr. Samuel Pearce Duffield (1833-1916), a physician and a pharmacist. In 1866, Hervey Coke Parke joined the company, followed by George S. Davis in 1867. Duffield left the partnership in 1869 and it became Parker, Davis & Co., Inc., in 1871. This company went on to invent hard gelatin capsules in 1874 and to manufacture vaccines, hormones, and serums by 1900. Although founded in America, the company had an overseas subsidiary based in London called Parker, Davis & Co., Ltd., that provided the Allied armies with medication during the Second World War. Parke, Davis & Co., was purchased in 1970 by Warner Lambert, Inc., which merged with Pfizer in 2000. Dr. James Luther Cathell (1914-1970) was born in Davidson County, N.C., to Dr. James Edwin Cathell (1877-1930) and Grace Sowers (1884-1971). The family lived for a short time in Wilmington while James Edwin practiced medicine out of a downtown office in the Murchison Bank Building from 1919 to 1922. After the untimely death of his father in 1930, James Luther went to live with his uncle and aunt, Dr. James Long Sowers (1894-1932) and Elizabeth Travis Sowers (1896-1933) in Lexington, N.C. Unfortunately, James soon lost his uncle in a car accident and his aunt to heart disease just a few years later. Meanwhile his mother, Grace, went to live with her parents Luther Columbus Sowers (1858-1940) and Fannie Long Sowers (1866-1951) in Boone, N.C.
James Luther received his undergraduate degree from Wake Forest University and his medical degree from Emory University in Atlanta. He completed his psychiatric residency at UNC Chapel Hill and served at John Umstead Hospital. James Luther married Drusilla Louise Martin on March 19, 1942, in Forsyth County, N.C. He was a respected member of the medical community and served as a member of the American Psychiatric Association, the New Hanover County Medical Society, and the New Hanover County Mental Health Association. Cathell also worked at the Southeastern Mental Health Center on South 17th Street.